Picture this: You've just finished compiling all the parts you need to make your own ultimate PC. But now you want a particularly cool case to complete the build. Why not make one from all those Lego pieces you have laying around? 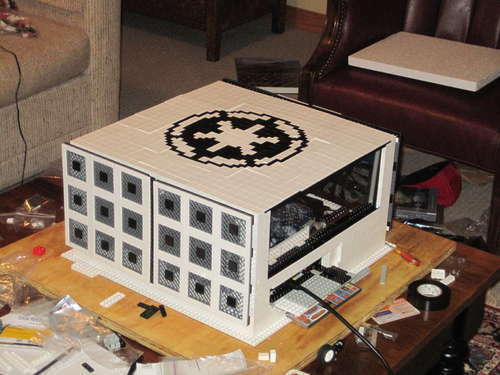 Instructables member "greenyouse" put together an extremely detailed guide on how to make a Lego casemod like his own. He states that not only does a Lego casemod last as long as you need it to, it's also extremely fun to customize and it makes a great conversation starter. On the down side, unless you have a few thousand Lego pieces laying around, it could get a little expensive, and hot--Lego bricks tend to retain heat. After mastering the basics of ultimate Lego building (the art is in how you lay the bricks of course) and creating brick mosaics, fire up a program such as Lego Digital Designer and get creating your dream computer case. The possibilities are somewhat endless with this mod, and greenyouse's tutorial leaves plenty of room for you to think up your own ideas. He also provides links to great places to order particular Lego bricks. Of course, just reading the instructions makes you appreciate how long this project may take. Then again, if you have already decided to make a computer from scratch, you're probably in it for the long haul anyway. Next step: creating a monitor and matching keyboard from our favorite toy. See the full guide on Instructables, and if you have ever made a Lego computer, or equally geeky gadget, don't forget to tell us about it.